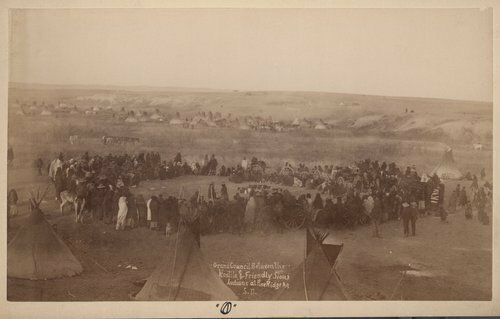 Twelve photographs showing scenes of the Sioux Indians at Pine Ridge Indian Agency and the Battle of Wounded Knee, South Dakota. During this time, the U. S. Army sought to curb the Sioux Ghost Dance. They killed Sitting Bull and pursued Big Foot. He led his people south to seek protection at the Pine Ridge Reservation. The army intercepted the band on December 28 and brought them to the edge of Wounded Knee Creek to camp. On December 29, 1890, the U.S. Army attacked Big Foot's camp killing him and approximately 300 Sioux. The Battle of Wounded Knee is considered the last major conflict between U.S. troops and Native Americans. A number of Chiefs in the photographs are identified on the specific image. The backs of several of the photographs have advertisements for the photographic company which was located in Chadron, Nebraska; for the Minne Pazuta Springs credited with curing epilepsy; and for E. F. King, the Black Hills Jeweler located in Deadwood, South Dakota.